It's a fact that in many of today's new home builds, either your living room or family room will be a smaller room. There are many things that can be done to help visually enlarge smaller spaces. There are ways to use darker colours and larger scale furniture in smaller spaces, but their successful use takes a trained eye. If you want to decorate a small room with confidence the following ideas are easily applied. 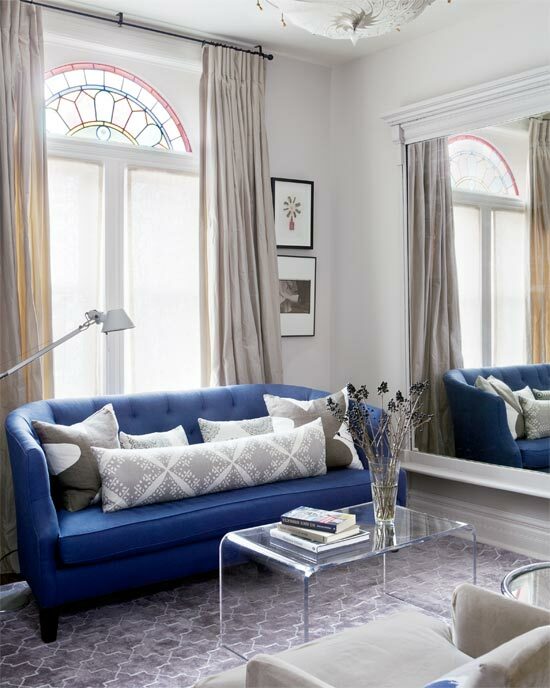 Choose furniture first and look for pieces that are light in colour and have legs. Lighter colours occupy less visual weight and legs provide an unobstructed view of the floor, allowing the space to appear more open. Coffee and end tables in metal and glass also allow the eye to move through the pieces consuming little visual space while dark wood furniture has the opposite effect. The cow hide ottoman above works because it is overall light and has great legs. It also serves to connect the tones of the wood pieces in the room. 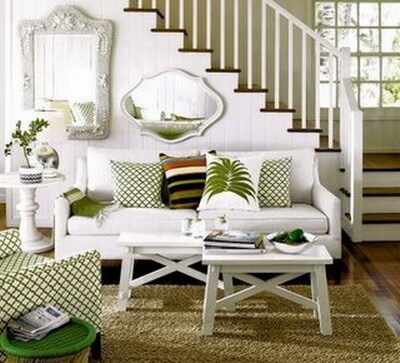 Mirrors can make a small space look larger but it's not that simple. They function best by reflecting light. That can be the light colour of the wall or refleced light. Be aware of what gets reflected in your mirror by standing in different positions in the room. I have seen mirrors actually decrease visual space because they reflect the wrong things. We often forget that a room has a vertical axis. Add things to the space to encourage your eyes to move upward from the furniture. Floor lamps, large vases with tall twigs, full length draperies, long mirrors, vertical paintings or stacked paintings, mantles, tables with multi- layered arrangements etc. are possible choices.Did you notice the large mirror on the end wall? If your room is small, choose smaller scale furniture. Armless chairs, apartment size sofas, small sectional etc. will make the room appear more spacious. Consider a bench rather than a conventional coffee table or a glass or lucite table as in #4 photo. Don't get carried away with this and end up with clutter by using too many small items. One of the best ways to deal with limited space is to choose dual-purpose furniture, e.g., a pair of ottomans can double as coffee tables, with storage inside; coffee tables with a lower shelf can hold baskets, books, covered boxes for storage; consoles with doors make tidy hiding places, bookshelves used as a sofa table when you can't walk around the sofa, etc. Give a small space character and maximum function with a bank of custom-built cabinets in a light colour. Built in cabinets and shelving triple storage options. 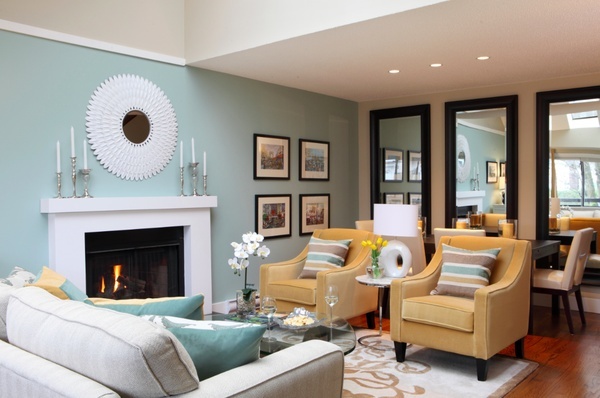 Keeping the colour of built ins light will increase the visual space. Arrange objects on open shelves in an artful way. Leave lots of open space and vary the sizes and shapes of decorative objects. If you have a sofa or sectional that you need to keep and it dominates the room, paint the walls a shade that is just a bit lighter than the upholstery . The eye will move across the room rather than sticking on the sofa. In the room above a stone wall harmonizes with the sofa and the warm yellow from the wall is picked up as accents. Find interesting ways to store the objects that are needed in a room, e.g., storage cubes, baskets, covered decorative boxes, ottomans, etc. This room has a lovely wicker basket which serves as an end table. On the shelf is a fabric covered box and the coffee table has a lower shelf which can be used to store books, boxes, baskets etc.Sometimes the more space you have the more objects you accumulate. Keep shelving organized. Lighting is important in any room but even more so in a small room. Keep window treatments light and airy so that the natural light can shine through or have drapes that can be pulled back to let the light flood in. . For evenings or when there is minimal natural light use additional lighting to maximize each area of the room. 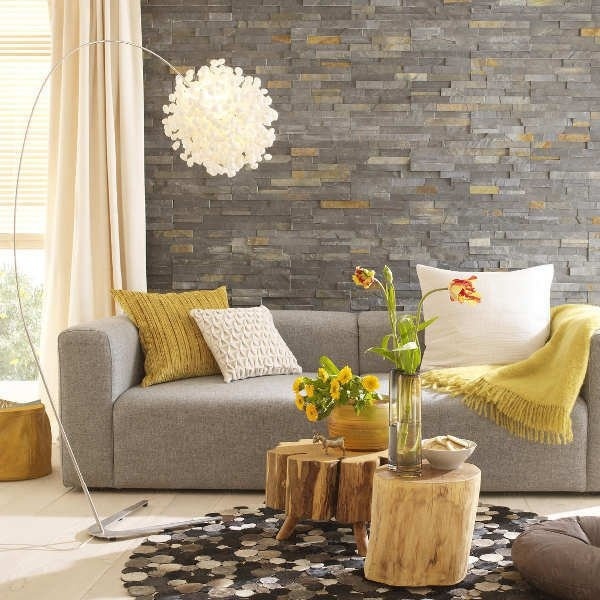 A dark corner is a great place for a floor lamp or an accent table with a lamp for reading. Wall sconces take up little space and can be used to highlight a certain areas of a room. Lights over artwork add an additional layer of brightness and highlight the artwork. I try to have at least four levels of light in a room- natural light, dimable ceiling lights, floor lamp or sconces, and table lamps. Do a visual check to see if the four corners of your room have adequate light. 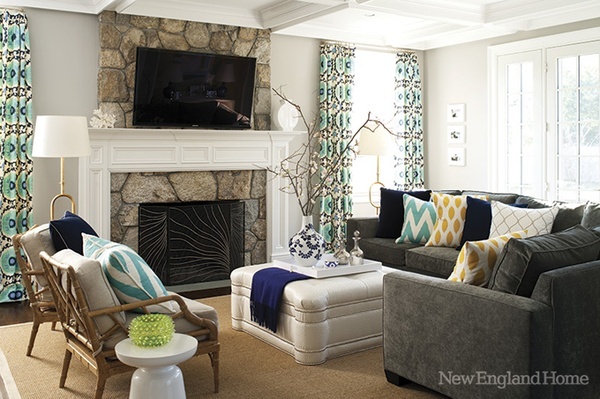 Many of these ideas will work in much larger rooms too. The most important thing to remember is to select furniture that is the right scale for the space you are decorating. Great points made in this article. I like the combination of the neutrals with a splash of brighter colors that seem to be in right now. Great article. Love your taste and sense of style. Thanks for dropping by. I enjoyed looking at your site. It is good to know that there is a professional painter in the area. I often get asked by clients about references for painters. Feel free to pass my info on to anyone Margaret. Cheers and Happy New Year to you. Thanks for the link on your Facebook page. It seems everyone is interested in window treatments. All my posts about this topic are well viewed on my blog. Small is a relative term. I tried to show a range of what would be considered smaller spaces by a variety of people. The suggestions for dealing with them remain valid no matter how tiny your living space is. What a amazing, useful article! Thank you. Very nice design, what kind of lighting have you set up to finish off the ambiance? Thanks for sharing and for all the pictures. My living room is very tiny and only has one window so it looks even smaller. I just have my couches and a mirror hanging up. I need color because it looks so blah. Now that I know to stick with lighter shades I'll go find some home decor in Petoskey Mi and hopefully find some pieces. These insights and tips are wonderful. I love all the examples you have in your post. Having knowledge of such kind will greatly help homeowners with smaller living rooms. For me personally, I do think that a smaller area is much easier to decorate and fill than a very wide one. Anyway, thank you again for these incredible tips. Please keep on posting. Thanks for the helpful insights. My house has a small living room and these ideas will surely help as I move stuff to make more space. The wicker basket is an amazing idea. I will soon get several and maybe splash a few colors in since my walls are plain white. Thanks again for the info. In fact, I believe that the most useful tips here is light palette and many windows. In this way the room seems to be much bigger. No matter the area space, your living room can look cozy and inviting with the help of the right furniture, arrangement and the materials used in constructing the room. You have provided us with great insights. Thanks for the tips! Some great tips here! Thank you they help! How would you suggest using this accent piece of furniture http://coco-interiors.co.uk/eames-lounge in a small room? What lovely set you have here! A lot of motivation and fun, thanks you so much for sharing this post. Stunning article! I love decorating our home and I'm looking for unique design. But I find this site, it gave me an idea for decorating our living room. This helped me very much, keep writing like this article. This will be serve as my source and guide in decorating our home. Thank you for this article. Do you want more KB Home? Find more here. For someone, this is a small space, but for another one, this space may be large. so how can we applied this tips for really small living room, for example 3x3 measure? I appreciate your appropriate tips and often read your blog for updates on home designing. Great post! Choosing the right colour and furniture are two important factors that everyone should consider in decorating their living room. Hi! Great ideas, but would appreciate further advice on decorating a granny flat. Space saving is of the utmost importance. Some cool tips! When we choose a nice colour, its easy to getting the point. Great post and images are also very attractive... and yes we can improve the visually size of room with the help of Interior Decoration. So truly! 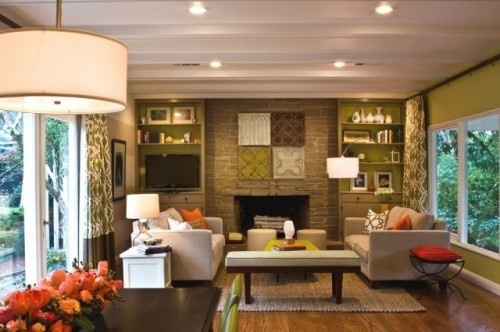 Choosing the right furnishing with the right color hues and the appropriate accessories, the room may look much bigger! Love them all.I love decorating my room.I really inspired with those pictures that you have posted here.So,really beautiful. Living Room Furniture for long time, so thanks for such a nice blogging . post. It was inspiring. Keep on posting! Amazing pictures and color combination. Excellent post! I must thank you for this informative read. I hope you will post again soon. Beautiful designs i really like it. Thanks for sharing. Thanks for produce wonderful blog article post. These are such phenomenal tips! I'm wondering what you think about having a bunch of windows to bring the light in to our living room? We almost want it to be a sun room, but still our living room since it's the first room you come into through the front door. Perfect tips...amazing ideas.. your multifunctional furniture tips is superb..waiting of your upcoming blogs.. www.umangrealtech.com. Very correct advice about the layered lighting. Mixing light sources using both lamp sets and natural light is the way to go. Don't put all your bulbs in one basket, you might say. I've been looking at changing the lounge and dining room for a while. I have magnolia at the moment with white coving and its been like that for 8 years. Got a bit bored with it now. Thinking of peppermint green. Thanks for this great article, has given me inspiration to take the plunge and change everything. Thanks a lot. Very helpful. Wonderful, wonderful article. Do you know how I can find that cowhide ottomon? Not sure where that ottoman came from but if you google cowhide ottoman there are lots of options. London Cows on Furnish .uk has a similar one. Cute interior designing and interior furnishing! I also get information about current window designing trends. I use Summerdale Mills for my home. Thank you for sharing with us such a nice blog. I love this tips, thanks! Well written post. You have put huge information in this single post. Keep it update in future too. Very nice ideas! We just bought two modern chandeliers from interior-deluxe.com and I wonder how to combine them with lighter furniture. Your post gave me some valuable suggestions. Thanks for sharing it! Good list of tips you have shared with us. I am looking for your more updates. Keep them coming in future too. These are some great green living tips. The real question is how many can I implement?! The post is quite interesting as its placed in very a good manner and it entails much useful information for me about , home decorating ideas. Now it makes it more easy for me to understand and implement on the concept. Thank you for the post. Great list of ideas you have shared with us. I would like to read your more updates. Keep them coming. I agree that the furniture should fit the room. I've been in places where there are too many chairs and stuff. It makes the place feel crowded. A little open space goes a long way. Many people don’t realise that with a good interior design, there is a lot of space in that little home. Thanks for the article. Thanks for this post! These are some really cool ideas, keep up the awesome work! Interestingly, some companies like http://www.newmanandbright.co.uk/ will actually come to your house and draw you up the size you need for the sofa and then create them according to those specific measurements! 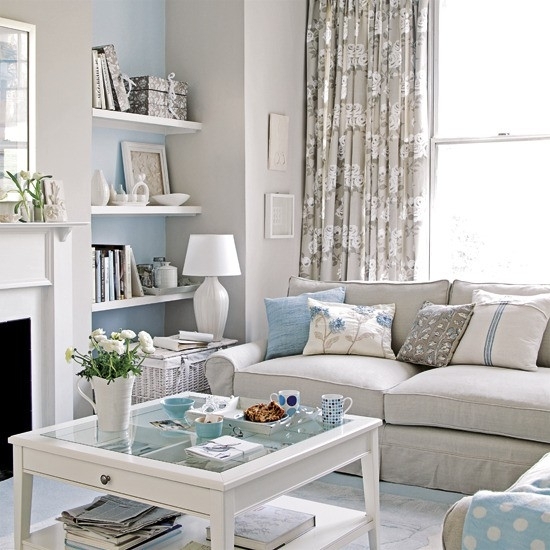 Thanks for giving such a wonderful tips for decorating a small living room. Oh! Lovely Info. Thanks for sharing wonderful information to all. Your tips are really very informative and i appreciate to you. Nice tips....Images are just awesome.. Will look forward to see more posts like this.. I liked everything that has white in color scheme. I do have a small room in my home. Would think of changing interiors after looking at your post. Quite good suggestions for small rooms, Do you have ideas for small individual sections of a furniture store? The same principles could apply when setting up small display areas. Excellent example of lighting. I think that the lighting can either make or break a room. Thanks so much for sharing! Thanks for sharing! Adding things vertically can make a small room feel larger. Good post! Seriously... Each of them 10 are usually excellent designs. Fantastic perform you spelled out all the concepts in a mere 10 details.. great job!! decor wonderful decor ideas-Find out best bathroom décor ideas to make your bathroom wonderful. Our decor ideas will help to make wonderful and modern bathroom. Visit at 1decor to get wonderful decor ideas for bathroom. It is really a nice and helpful piece of info. Im glad that you shared this helpful information with us. Thanks for sharing. It’s really very informative that I wanted ever about furniture design, thanks for this. Nice home improvement tips. This is amazing inspiration to show that a small space doesn't have to be boring. 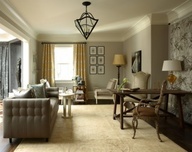 Nice information about Tips for decorating a small living room,thanks for sharing this information. Turn your bedroom into a space that reflects your personality while also providing you ultimate comfort and peace by choosing the right furniture from Prestige Furniture. Choose from our huge collection of bedroom furniture in Devon including stylish beds and couches, vanity, cabinets and further furniture and furnishings to suit your unique tastes. Really good and nice design blog! nice tips shared to improve the home decoration. Thanks for sharing..
Small living rooms can be difficult to decorate, but it can be manageable if you have the right information. Good read. I read your blog & found that it is really informative if we have small living room. Your ideas are really unique which are really useful for small living room. Thanks for sharing your blog with us. I would consider these points while decorating my living room. Keep Updating and kindly also update ideas for big living rooms. I think this article from the blog of Kings Great Buys will complement this article. Its stunning .. astounding and amazing too. I 'm going to impart this post to my companions. Much obliged to you to such an extent. Keep it up !! Your tips are really great.I love tip 5 and 6 so much.All tips also looks beautiful and amazing.Thank you for sharing these special tips. We provide the best and highly quality for table lamps, desk lamps, floor lamps at EliteFixtures. All covered by a full warranty. With Prestige Furniture, get the most durable and long lasting furniture and accessories of your choice at an affordable price delivered right to your doorstep. Whether you are seeking classic furniture or contemporary design, our renowned furniture store in Devon will cater to your individual needs in a personal and professional way. Surely these 10 tips are enough for decorate a small room perfectly. It will help me to decorate my room nicely.Thanks for your share. Precise Lighting offers you the simplest and most convenient way to purchase modern lighting, Contemporary lighting, commercial lighting & energy-saving lighting fixtures for your home, office or commercial area. Browse our vast collection of ceiling lights, chandeliers, wall lights and outdoor lights. Very useful information, thanks for sharing such a informative post. I really enjoyed your tips about living room decor.Everyone wants to decorate a space in the best possible manner.You shared great tips.I would like to share one from my side. If a person adds Black mirror in living room then he can enhance charm of an overall space indeed. Helpful recommendations you have shared. For more information about living room ideas visit thehappyhomes. I appreciate the efforts you people put in to share tips on decorating small living room, it was really helpful. Keep Posting! Thanks for your this lovely and wonderful post about home furniture. Home improvement is such an important and evolving topic. I keep reading your and The Happy home blog for information on the topic. Decorating a small room isn't an easy task you have to deal with the space and required furniture. It looks odd if you put too many furniture in the room. Thanks for sharing your photos. Thanks for this useful information that to decorate small living room. check out these. it may help you. Thank you for sharing this interesting and informative article, painting with airless spray gun will be faster and more interesting! Thanks for the information, check the best outdoor furniture in chennai. Hi Nice Blog Post. You have mentioned almost everything which can make our living room looks good, except one thing. Guess what? The Flooring. You haven't mentioned it. We all know that flooring plays a very important role in the aura of the room. Living room tiles are very good to add on the list. You can choosewooden flooring as well depending upon the area you are leaving and that definitely give a beautiful look to your home. Some good tips here, thanks for letting me know about it. It can bring a living room beauty. Thank you so much for sharing such a nice and very informative blog about decorating. Looks amazing, very inspiring design. Thanks for your efforts on sharing this useful article with us.. 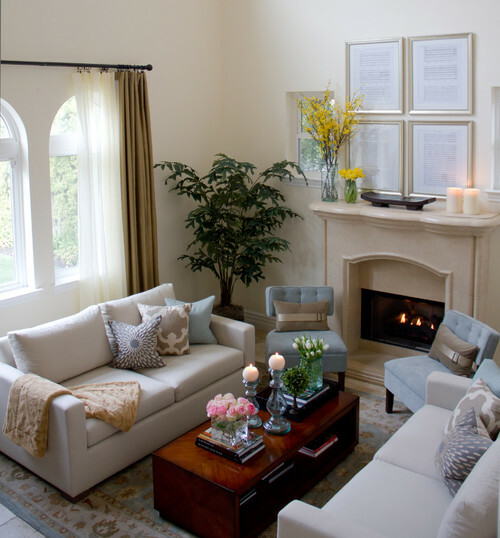 Living rooms designs are very good.Nice blog. Design is a big part of my life and I like to share my thoughts, inspirations, and knowledge with my readers as they work to create individualized spaces in their own homes. Awesome Inc. theme. Theme images by claylib. Powered by Blogger.